This is both duochrome and sheer. Sometimes that's a problem, sometimes it isn't. In this case, it isn't a problem at all because it looks great both sheer and layered with more coats for opacity. 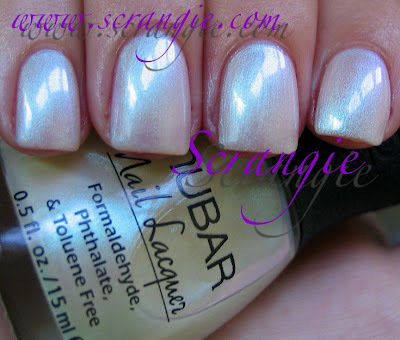 But, it's very rare for me to wear a sheer polish sheer, so I add the extra coats. It's worth it. 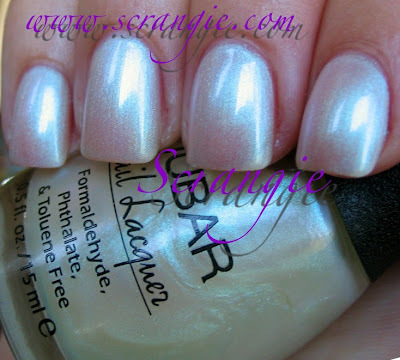 Nubar Angels Whisper. This one is very, very hard to capture in photos, but I tried my best. It's a pearly white base with blue, purple, pink and green multichrome. It looks delicate and, well... Angelic. It shifts colors a lot, too, and I'm especially fond of the pink/purple side of the flash against the white base. Just like mother of pearl. I did five coats; it's really sheer. And this is one that I don't like layering. Here's two coats of Angels Whisper over black. Layering it just kills it for me. Takes away all the mother of pearl beauty. Bleh. Hate it. Looks better alone. Now, I could layer it over white and it would probably look good, but I didn't have my white polish handy when I swatched this. Will have to try that one day. I was going to say I wonder how it'd look over white....and with China Glaze Snow Globe over the whole thing! I'm not usually a fan of these kinds of colors but you've made me fall in love with this one! Beautiful! It looks like it's layered over blue instead of black.. but I like that! Wow, I never thought about how it looks over black. It's stunning. I'm glad it's on its way to me. Gorgeous! I never mind layering polishes a lot, as long as the end result is nice, only problem is it takes aaaaages to dry!! I like it over the black, too! 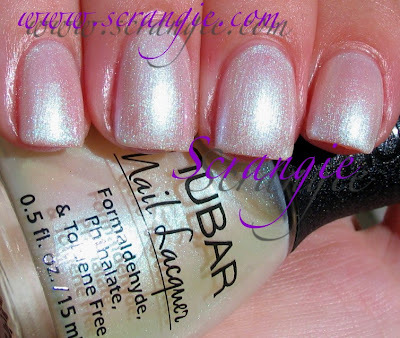 It looks almost like one of the CND Effects shades, in that it seems to lighten the base color so much, instead of just adding a top layer of sparkle/shimmer. But five coats? FIVE? To wear on its own? Dude, I get grumbly if i have to use *three* to get opacity. I don't usually go for these kind of soft colours, but this one's pretty. Not sure if I'd want to layer 5 coats of it, though. I like the way it looks on you! Your killing me! Very pretty but I don't like that many layers. Will have to wait & see when you layer this over white.